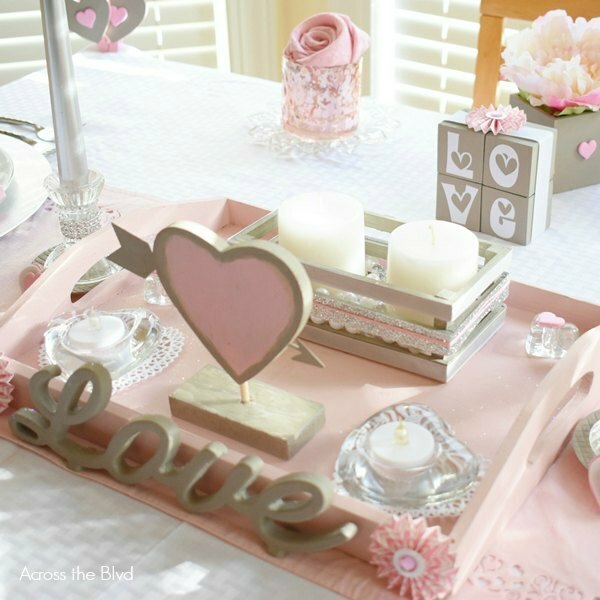 Creating a pretty Valentine’s Day tablescape is something that I enjoy every year. I like to change up the color palette and find new ways to reuse old decor items. This year, I’m using a combination of pink, gray, and white for a softer look. As I was planning and sorting through my Valentine’s decor bin, I gathered several items that just needed a new coat of paint to make them work with this year’s decor colors. The metal Love sign was gold, but with a coat of Folk Art Home Decor Chalk Paint in the color Castle, it’s fitting in nicely. I’m reusing the same tray that I painted for my Let’s Flamingle party. One of the things I like about using vinyl letters is that when I decide to give a piece a new look, it’s easy to remove the vinyl. 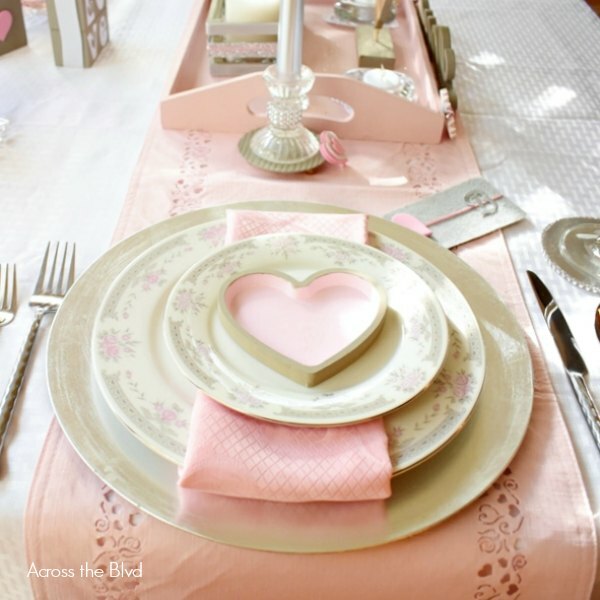 I didn’t need to repaint the tray because the shade of pink was great for the tablescape. I’ve had this small wooden crate in my stash for a while. I gave it a makeover so that it can be used as a candle holder. I’ll be posting about this and some other easy DIY Valentine projects soon. The coasters started out as cardboard coasters, but with the addition of jeweled ribbon, felt and vinyl, they match the tablescape nicely. Little touches like adding some jeweled ribbon and some hearts to the candlesticks are easy ways to dress up plain items. 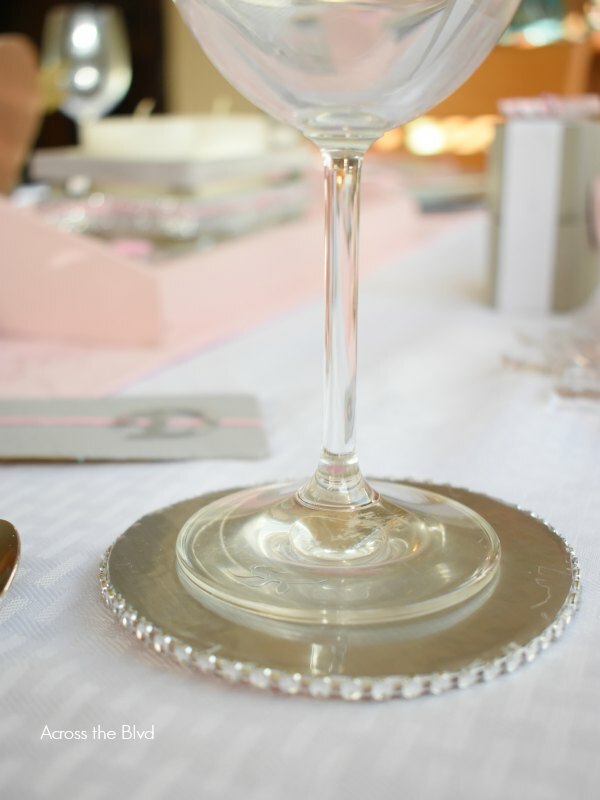 Another easy way to dress up a tablescape is by using pretty napkin folds. This rose fold is easy to do and always looks pretty. This set of china is one that I’ve had for more years than I can remember. 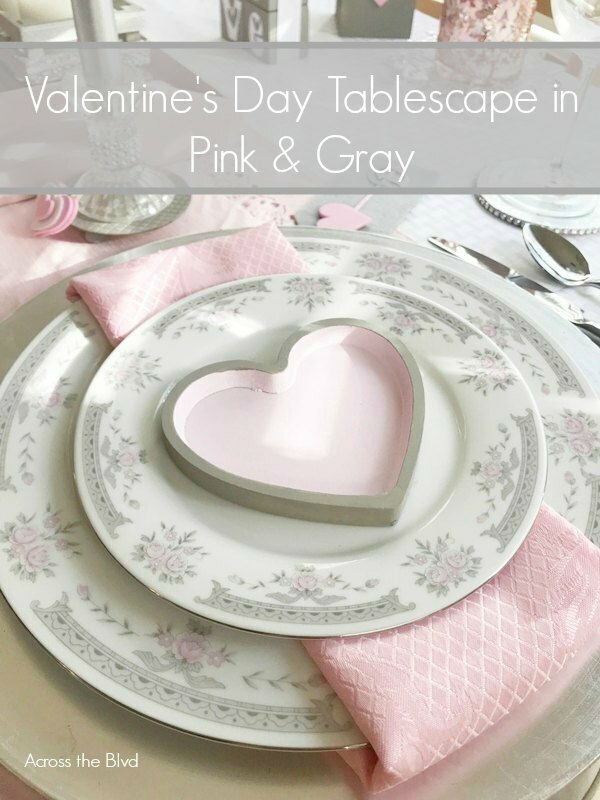 It’s only a four place setting, so I don’t use it often, but it’s perfect for this year’s Valentine’s Day with its pink flowers and gray trim. I’m using gray chargers and pink napkins. I found the heart Target in the Bullseye’s Playground area for $1 each. They had labels on them that said ring holders, and they were trimmed in gold. With a quick coat of gray paint, they are just right to hold an after dinner piece of candy. I’ll be sharing the quick and easy recipe for heart candy tomorrow. 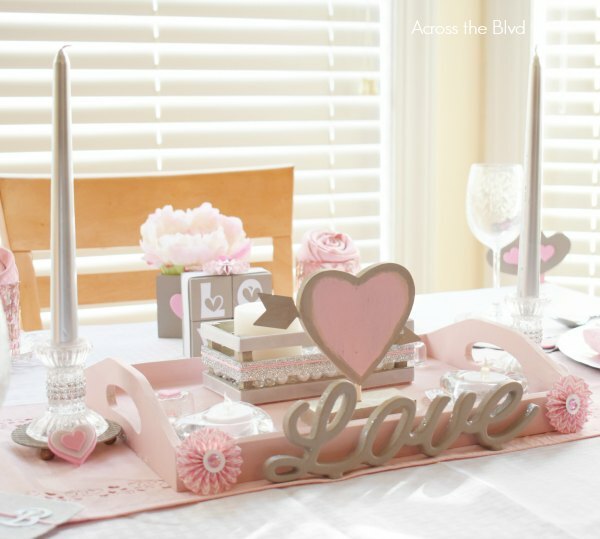 A few other DIY touches and our Valentine’s Day Tablescape in pink and gray came together. The Love Cube is something I put together from items in my craft stash. Stop by for our monthly blog hop challenge on Monday when we’re joining a group of blogging friends for a craft destash challenge. I’ll be sharing the simple how to then. Using what you have on hand is always a great idea for seasonal decor. The small hearts that I’ll be using to hold an after dinner candy are the only new purchases I made. Paint is almost always the best way to give a new look to items you already have and a great budget friendly way to decorate. My husband and I started dining in for Valentine’s Day years ago. I cook something special and prepare a favorite chocolate dessert. We dress for dinner as if we were going out, but staying in is so much more enjoyable than being in a crowded restaurant. We save dining out for the weekend following Valentine’s Day. 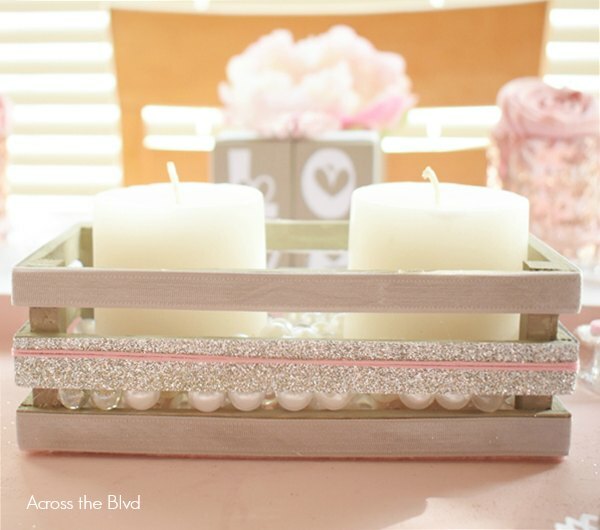 You might also like these Valentine’s DIY Projects in Pink and Gray. We share at these great parties! Beautiful table Beverly. I love the pink and gray combination. You Know it just dawned on me I haven’t seen an email from you in ages. 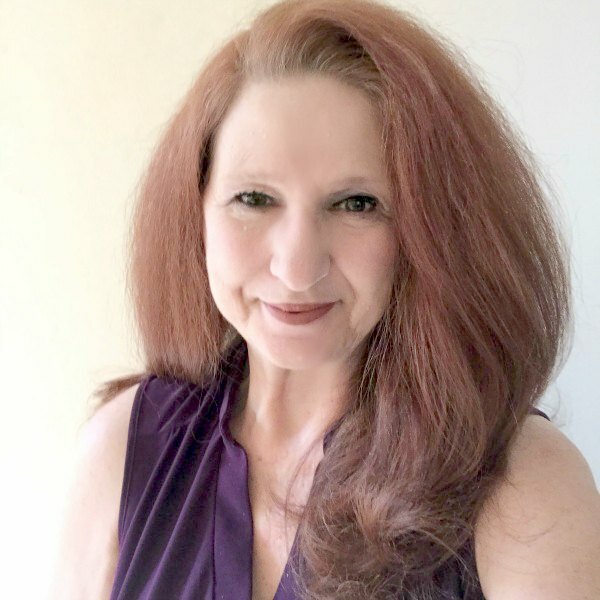 I signed up several years ago when I first started blogging. I’ve noticed I no longer get many blog updates from several bloggers I enjoy. I signed up again. At least I’ve kept up with most posts due to the link party and Facebook. Happy Thursday! Thank you, Carol. I’m enjoying that combination of colors this year. I did notice quite a while ago that you had unsubscribed when I was clearing up my MailChimp list. I’m happy to have you signed up again! Ooohh. Pretty! This inspires me. I haven’t thought about my Valentine’s day table setting yet. Thank you! I had to make time to put this together before it was too close to Valentine’s Day. The days seem to zip by! 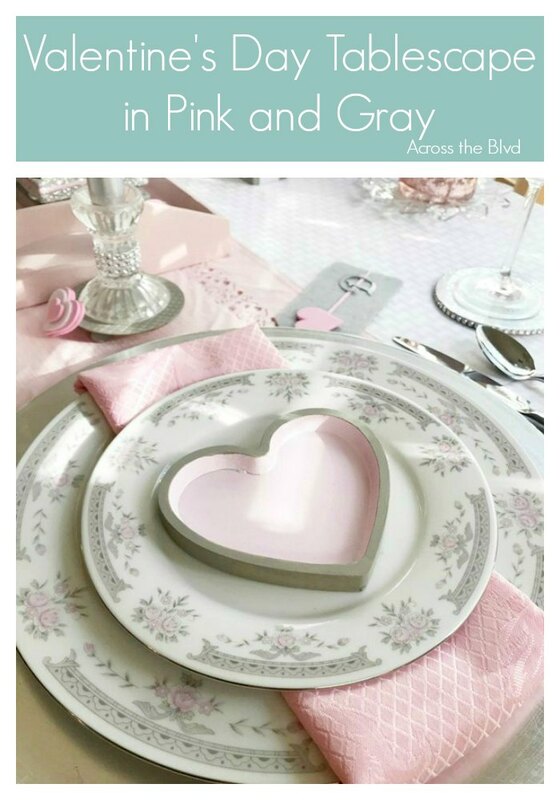 Beverly, what a lovely, inviting color palette mixing the gray with the pink! It gives pink a more sophisticated look I think — an idea I may borrow from in the future if you don’t mind? 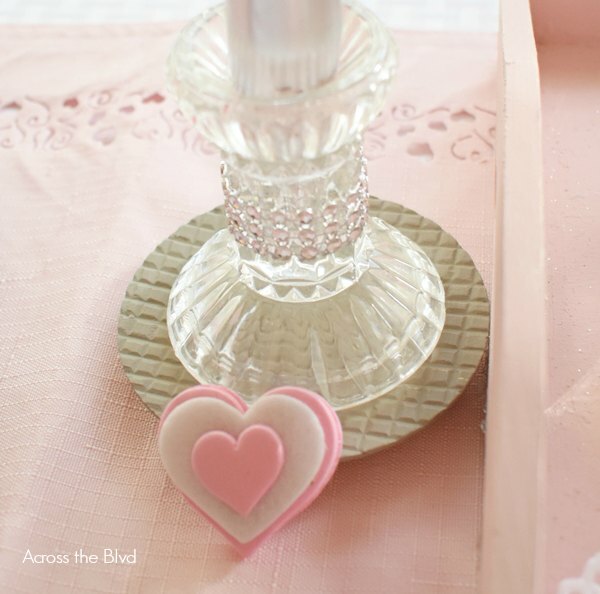 Also love the little rose napkin fold, it’s so cute on the table and easy to do (even for a klutz like me LOL!). And, you do more with paint than anyone I know to transform and create. Thanks so much, Debbee! I’m enjoying this look. I’m delighted to have given you an idea. Your tablescapes are always lovely. I do love simple transformations with paint! Such a pretty table. 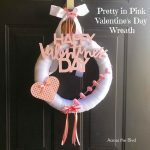 I’ve always liked pink and gray together and you have so many little added touches here and there that just add to the whole valentine feel. Pinned. Thank you, Joanne! It’s a great color combination. Thanks for pinning! What a sweet little setting! 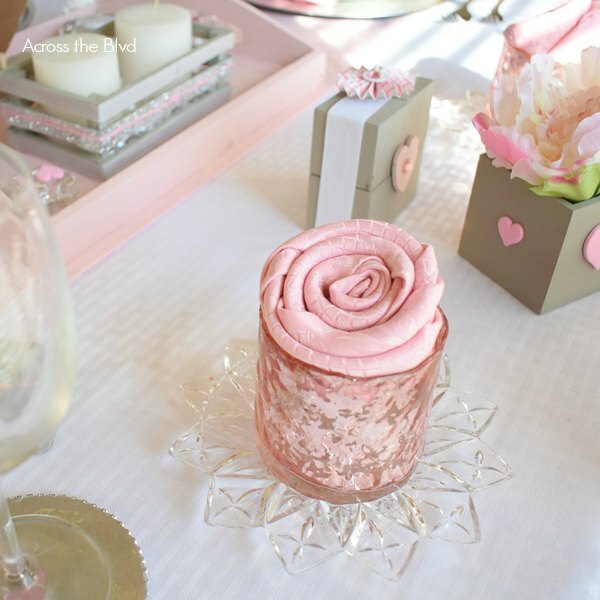 Love the rose napkins. Thanks, Alexandra! I love fun napkin folds and this one is super easy. How pretty! I love the pink and grey! Especially the rose napkin! Thank you. I love the napkin fold, too. Plus, it’s a really simple one to do. 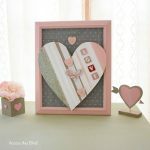 Pink and Gray are Gorgeous together and a perfect combination for Valentines. 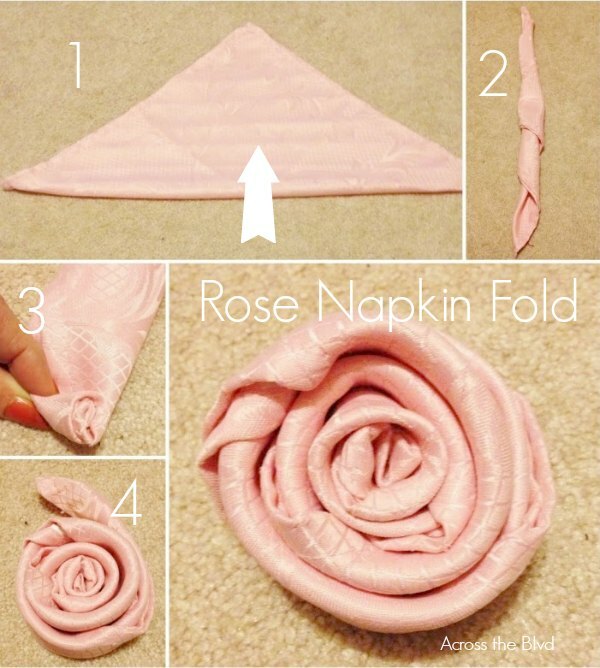 I love the rose tutorial for cloth napkins. I do not own any cloth napkins as I rarely used mine. I donated them recently, but I may have to find some pretty pink ones like yours for the Rose fold! Pinning! I enjoyed those colors for this year’s Valentine’s Day decor. They worked great together. I have a weakness for napkins, and I love finding ways for pretty folds.